Published on Thursday, 22 June 2017. Today (3.30pm), at the House of Lords, The Property Ombudsman (TPO) launches its latest annual report, which reveals an increase in the number of formal complaints resolved by the scheme and a record total of compensatory awards paid by agents. Other focus points include key reflections from the TPO Board and Council, top causes of sales and lettings complaints, as well as data concerning disciplinary cases and agent expulsions. Also included are several consumer case summaries providing a snapshot of the work carried out by the Ombudsman. The top four causes of complaints were (1) ‘Management’, (2) ‘Communication & record keeping’, (3) ‘In-house complaints procedure’ and (4) ‘Referencing’. The top four causes of complaints were (1) ‘Communication & record keeping’, (2) ‘Marketing & advertising’, (3) ‘Instructions/terms of business/commission/termination’ and (4) ‘In-house complaints handling’. “TPO works with the industry and consumers to get things right, put things right and set things right. This year, TPO’s Codes of Practice, approved by Chartered Trading Standards Institute (CTSI), have been revised to clarify many of the issues consumers found confusing or misleading, including full disclosure on fees and charges, pre-contract deposits and referencing. "To help put things right, we resolved a record number of complex complaints, which resulted in total awards reaching £1.2 million. We will continue to set things right by promoting best practice through our regular case studies, regional workshops, industry seminars, and national conferences. 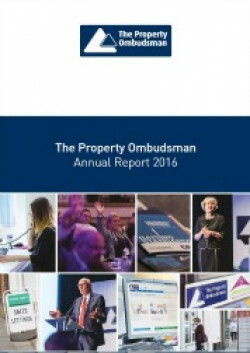 The annual report provides a series of case summaries highlighting examples of the varied and complex cases reviewed by the Ombudsman. TPO’s Codes of Practice provide the framework for the high standards expected of members and give the Ombudsman the means by which to investigate disputes fairly and consistently. The case which resulted in the highest award paid by an agent during 2016 (£21,972) features in the report. To view the case in full, please click here. The Annual Report and all case summaries are available now on the TPO website. [i] TPO can consider sales complaints from potential Landlords and Tenants Buyers, Sellers, and other third parties affected by the actions of the agent. [iii] TPO can consider sales complaints from potential Landlords and Tenants Buyers, Sellers, and other third parties affected by the actions of the agent.